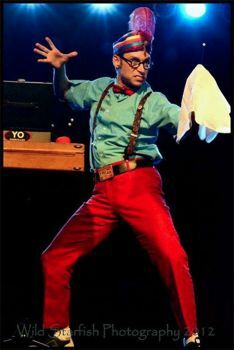 Swami Yomahmi (Yo’ Mommy) performs phenomenal feats of physical comedy and linguistic vaudeville. He creates fractured fairytales drawn from the Sideshow aesthetic, infused with a love of pop culture, witty repartee, paralyzing puns… and a rubber chicken! As the creator of The Cheeky Monkey Sideshow, he has also appeared with The Carnivalesque Roadshow, The Arch Campbell Variety Show, Coney Island’s Congress of Curious People, and the 98 Rock Morning Show. He’s been featured on National Geographic’s “Is It Real?”, in the Washington Post Magazine, the film “Step Right Up” and the books, “Weird Virginia” and “Carny Sideshows”.